Drifting often confuses road racers and autocrossers, as the winner isn’t always determined by who crosses the finish line first. But for Kyle Mohan, driver of the Built 2 Apex/Mazdatrix/KMR MX-5 in the Formula D series, it’s an amalgam of all the best parts of racing. For the uninitiated, drifting is all about doing a lot of the things a road racer doesn’t want to do too much of – sliding and spinning the tires. Drivers are judged on their line, their slip angle and style. Eliminations in tandem drifting are determined by two laps, where each driver leads and sets the line and pace, while the other driver mimics as closely as possible the lead driver’s moves while also putting pressure on them to go faster and make a mistake, just like a road racer does while trying to pass. It’s got great entertainment value, Mohan said, but the real attraction for someone who likes to let their imagination run wild is it has very few rules. “We can run any motor we want, we have to use radial tires and we have to use an OEM chassis,” he explained. Thus a 1,000-plus horsepower turbo three-rotor in an ND MX-5 chassis. Mohan didn’t set out to get involved in drifting; it just arrived on the U.S. motorsports scene as he was looking for an opportunity. Growing up in Southern California with a mechanic father and an artist mother, he spent his childhood attending races at Long Beach, Riverside and Auto Club Speedway and dreamed of a job in motorsports. He was studying arts with the thought of getting into automotive design, but the cards weren’t playing out. “I started to realize the art stuff I was doing, whether it be sculpting or fine art, was very much applicable to the automotive industry. But I wanted to stay in California, which meant I probably wasn’t going to move to Detroit or Europe to do car design. On top of that, I was in that generation where it went computer really quick, and I wasn’t necessarily a computer guy. I wanted to be hands-on. The racing industry got that for me,” he explained. He started at Mazdatrix in Signal Hill, California, sweeping floors and changing tires. Then he started applying his arts background, moving into welding, fabrication, graphics and composites. The next step was learning the rotary engine and how to build it, and Mohan’s world started to come together. “I found a cheap 1982 RX-7. I was building race motors for other people, and I built one for myself. It was a great way to showcase what I thought these motors were capable of. Quickly me and Mazdatrix started to get their E Production cars into race wins, track records, and fastest trap speeds. We started getting more business, and I’ve been building motors ever since,” he said. He started looking for a way to showcase some higher-level stuff than he could do within the confines of typical road racing rules. Time attack and drifting were growing in popularity, and Mohan found his niche, in venues with few restrictions in the rulebook and at the same time hugely marketable. He notes that doing so met with the disapproval of many friends, and even his father. But he was captivated. In the time since, he’s gone through a 1988 Turbo RX-7, a 2009 RX-8 and now the 2016 MX-5 Miata. He’s certainly a die-hard Mazda guy, for many reasons. “Obviously we want to showcase the rotary. We love going against all these high-displacement guys – Chevy’s backing the LS guys, Ford is backing the Mustang guys, and here I am, basically a privateer with this 20-year-old Mazda motor giving them all a run for their money. 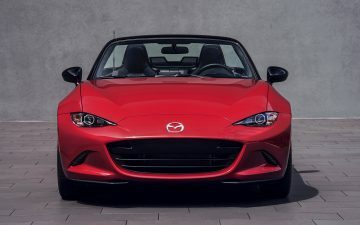 That’s a huge engineering statement for Mazda, that this motor to this day is still an amazing race motor – extremely reliable, extremely powerful,” Mohan noted. While the build of the car – look for more on that in the future – satisfies Mohan’s inner gear head, he realizes that as a professional drifter, he’s in the entertainment business as much as the motorsports business.